Dave Meltzer of the Wrestling Observer Radio is reporting that Finn Balor will be the next WWE Superstar to get a shot at Brock Lesnar's WWE Universal Championship. 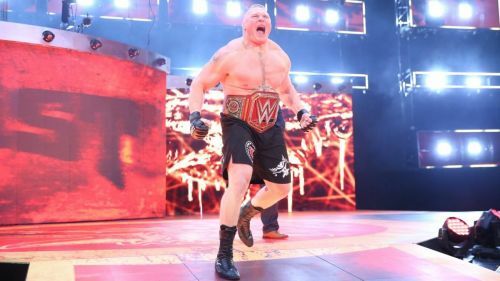 Lesnar successfully defended his title against Braun Strowman at last night's No Mercy pay-per-view. However, Finn will have to finish off his feud with Bray Wyatt first. Finn Balor is the first WWE Universal Champion in the title's short history. He won the championship at SummerSlam in 2016 but vacated it the next night on Raw due to a shoulder injury. Meltzer speculates that Lesnar will return next at either Survivor Series or Royal Rumble. Survivor Series takes place in Houston, Texas on November 19th, while the Royal Rumble takes place in Philadelphia, Pennsylvania on January 28th. If Lesnar doesn't compete until the Royal Rumble, that will lead up to more than four months between title defences. However, if he returns at Survivor Series, there will only be one pay per view (Tables Ladders and Chairs) that Lesnar doesn't compete in. Finn himself said that he was going to go after his title, last night on RAW. However, it also looks like his feud with Bray isn't over. So, it looks like he will face Bray Wyatt at TLC before facing Lesnar at Survivor Series. Balor has not received a one-on-one chance to regain the championship that he never lost. He made his return from injury on the Monday Night Raw after WrestleMania this year. Finn will face Bray Wyatt first and could move on to face Lesnar after that. While I'm excited about Balor getting a chance to regain the championship he never lost, I have zero hope that he will take the title from Lesnar at Survivor Series or Royal Rumble. I have a good feeling that Lesnar is keeping that championship all the way to WrestleMania with a rumoured match against Roman Reigns.